That’s what Abby said about this soup when she came in from the backyard, and it was exactly what I was thinking as I ladled the noodley broth into a bowl for her lunch. Wow, that was fast. This was yesterday — a holiday — and we had been on the road at various soccer tournaments throughout the DC area for three straight days. I don’t know how much time I logged in the car, but let’s just say I’m not going to be on the receiving end of a Friend of the Environment award any time soon, and the idea of getting in the Mazda even to go grocery shopping was more than I could handle. Instead, I did what I do best: I procrastinated. If I could just scrape something together for lunch, I could maybe buy myself another few hours watching Glee re-runs before hitting Trader Joe’s. The fridge was looking bleak — even the peanut butter jar was scraped clean — but I found an onion, a handful of dusty looking baby carrots, and about 30 ounces of a 32-ounce chicken broth container, which was about five minutes away from expiring. There was a single fat chicken breast. Maybe it was the ingredients speaking to me, or maybe it was something more primal (with chicken noodle soup moments, you can never be so sure), but I needed soup. That was as big and obvious to me as anything. I’m not in the habit of whipping up homemade soup for lunch – or dinner for that matter — but now I’m wondering why that is. My friend Pilar used to give me soup recipes in pictures, drawing a cross-section of the stockpot to show me each layer of flavor: aromatics, seasoning, broth, fillings. And that’s really all the instruction I needed to turn a tumbleweedy, end-of-week fridge into something pretty damn comforting. Is it going to yield a flavor that is deep and multi-dimensional and Ivan-Ramen-worthy? Uh, no. But did it get the job done? Yes. And then some: There’s a batch of it in the freezer waiting for me for tomorrow’s dinner. I don’t love soups that are overly brothy, but if you do, no need to include as many noodles as I did. No set rules here. Add olive oil to a medium pot set over medium heat and add onions, celery, carrot, salt and pepper. Saute about 2 minutes until vegetables have slightly softened. Add broth and bring to a boil. Add chicken, reduce heat, and simmer for about 12 minutes. Remove chicken from soup and shred with two forks. (The less artful you are the better.) Bring soup back to a boil and add pasta. When angel hair is cooked through — about two minutes — add chicken back to the post. Season to taste and serve. Jenny – why freeze if you plan to use so soon? Why not just put in the fridge? Bonus points for a couple dashes of tabasco or hot sauce. I love reading these posts – so comforting! Also, the soup looks so tasty! I would love to add some kale! This was our dinner last night, only with pasta shells instead of noodles! Needless to say I hit the grocery store this morning! I buy the mirepoix at Trader Joes in the produce section (3-4 at a time), sauté in olive oil and freeze in baggies. Always so happy to pull one out, dump in a pot or my crockpot with a few others things and, voila, soup! 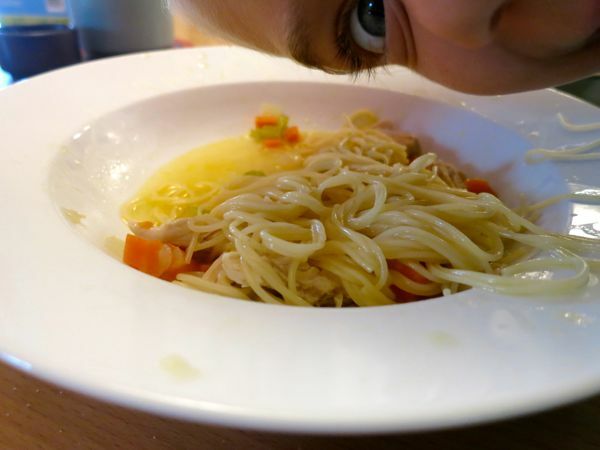 Soup is such a natural progression of the leftover protein and since they have been little, my girls always got a kick out of choosing the noodle- we would proudly throw around a fake italian accent while exclaming “Moscaccoli, penne, farfalle” into the carts. Now that they are older and we are all cooler, we really like orzo, trader joe’s israeli couscous (round dot noodle the size of a unfortunate pimple) and of course- old school stars. For leftover ham: I cook strips of bacon in the bottom of the soup pot add the mirepoix, seasoning, and then broth, water and the ham bone. I let that extract all the flavor it can before pulling out the bone, adding the leftover ham, a can of whatever beans I have in the fridge and the trader Joe’s cous cous. Season to taste- everyone loves it. 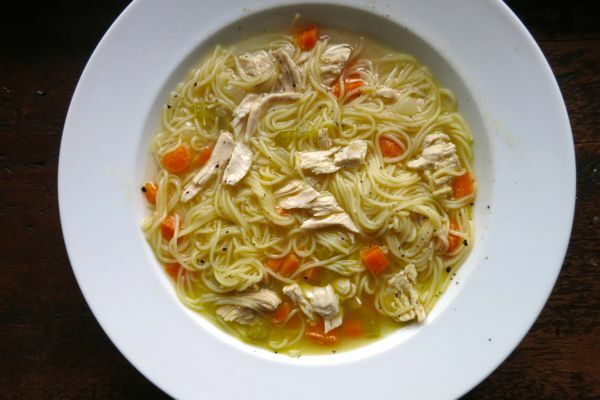 So this is roughly the chicken orzo soup, yes? I made a batch of it Sunday, and have the rest in the fridge for supper tomorrow (a quick reheat if our Little League practice doesn’t get rained out). Did you really put it in the freezer for just one night? It really hits the spot, by the way! So this is roughly the chicken orzo soup, yes? I made a batch of it Sunday, and have the rest in the fridge for supper tomorrow (a quick reheat if our Little League practice doesn’t get rained out) It really hits the spot, by the way! In our household, every week includes a whole chicken. Whether roasted or parted and baked / grilled / pressure cooked, the carcass, bones, and any giblets end up in a pot on the stove to cook overnight and in the morning the broth gets strained and tucked in the fridge. There will be soup that night, including whatever meat is leftover, plus whatever veggies the fridge will cough up. Additional broth goes in quart containers in the freezer for future batches of soup, chili, rice, polenta, and so on. This is a cornerstone of our weekly meal plan and takes care of at least two dinners and followup lunches (really big chickens become two separate suppers plus the soup routine). I have a soup fetish. In the fall and winter I make homemade soup almost weekly – typically on a Sunday so we can have it for lunches during the week. This looks SO good and I had to laugh at that last photo, too funny. That said, I made my first chicken and rice soup sometime last year, and from memory as my late mother used to make it, and it was one soup that didn’t take all day, just to do the broth since it was made from the carcass of a chicken, which as you know does not require as lengthy a cooking, just to turn into broth like say, beef stock. Anyway, it was most delicious for my first time too. I think I paired it with a grilled cheese sandwich. I have 2 chicken carcasses (from 2 roasted deli chickens) to turn into stock soon in my freezer. So you posted that today to be all YEAH WHO’S THE SELF-RIGHTEOUS CONDESCENDING PLAN-AHEAD ANTI-FEMINIST KITCHEN-TYRANNY GUILT-PROVOKING NOW, HEFFERNAN? Dusty carrots IN YOUR FACE. I saw that photo and wondered what fresh crazy Internet thing put my lunch on a website. I did this today too. Ran home for lunch. Whipped out the same ingredients (+ ginger and splash apple cider) and had great lunch and got back to work in just over 60 mins. This sounds delicious! I have a rotisserie chicken I want to use. Also, I just purchased some mushroom/sage olive oil that I think would be wonderful to saute the onion, celery and carrots in. I have egg noodles, angel hair, and even rice noodles that would be good in this. Thanks for another great dinner! Serendipitious! I need to use a rotisserie chicken and I had almost everything else. I saw this post and thought, “Hey, I can do that!” And I did it. And my kids ate it. (With lots of saltines…) Thanks! Not nearly as healthy as the olive oil, but when making soup, I always use a pat of butter for the sautéing of the onions and veggies. It just adds a fabulous oomph of flavor to the end result. thank you! thank you! thank you! once again, you have saved my dinner with great wit and a super recipe! Funny to see this post tonight as I was congratulating myself for making a quick veg soup – perfect for a solo supper tonight, and lunch after my morning job tomorrow – and I thought to myself – why aren’t there soup recipes in dinner a playbook. You got my attention with the comment about broth about to expire. I’ve noticed it usually says “consume within 7 days of opening.” If I don’t, is it a serious concern? I keep the carton way in the back of the frig, where it often freezes… so I figure it must still be okay if I have to thaw it to use it?! !